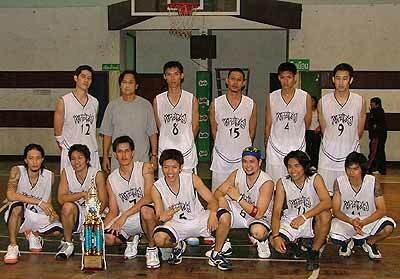 Yuparaj A defeated Pra Pai Fun C 104 to 82 in the final match of the Chiang Mai basketball competition 2005. 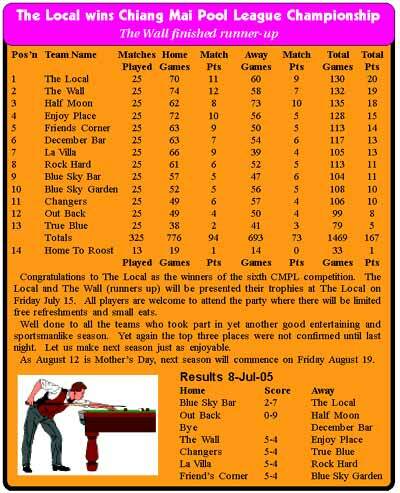 The win earned Yuparaj A the league championship. A representative from Yuparaj A receives the championship trophy. 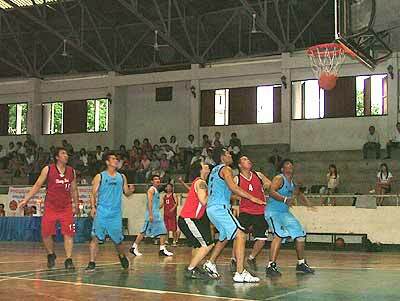 Twenty-four teams entered the Chiang Mai basketball competition, which began back on June 8. The finals took place at Chiang Mai Municipal Stadium on July 9. Tew Pai Lom and Rajamangala University faced off in the consolation match, competing for the honor of being second runner-up for the season. In a close, exciting game, Tew Pai Lom defeated Rajamangala 79 to 77. After the competition, Tinnakorn Numboonjitt presented the league championship trophy and 10,000 baht to the champion, and trophies plus 2,500 and 2,000 baht to both runner-up teams. 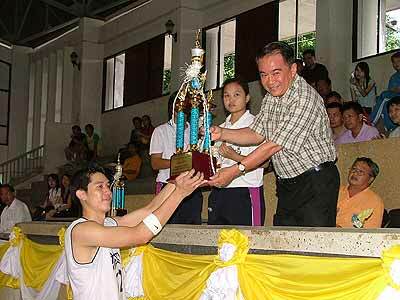 Yuparaj A, Chiang Mai basketball competition 2005’s champion from Tinnakorn Numboonjitt. Tew Pai Lom and Prapai Fun fight it out for third place. On Friday July 8 a friendly soccer match took place between a local team from Siriwattana Church and the Berg Soccer Club from England. The first goal was scored by the English team shortly after the kick off and several more followed until the Siriwattana team managed to slip past their opponents’ line of defense to score their first goal. Since the Berg club consisted of only 10 team members and they were playing by the official FIFA rules of 11 a side, this Chiangmai Mail reporter covering the event was asked to join the team for the second half of the match. After a spectacular show from both sides the match ended with a 6-2 score for the Berg Soccer Club. The team’s manager, Michael Taylor, wanted to do something interesting with the club and so he took them to play some friendly matches in the Land of Smiles. Although this is the first time he has done something like this, all of his team mates very much liked the idea of playing against teams in other countries. They may also go to next year’s World Cup in Germany for a chance to play against teams from that country. The art of yoga has been well entrenched in certain areas of Thailand for many years, and one local choice is a studio run by Marcel Kraushaar, a Swiss-born German who has been teaching yoga in Thailand for almost 20 years. Marcel learned the art of yoga and meditation in Sri Lanka and India some 25 years ago. His new Hatha Kriya Yoga Retreat Center is located near the Technology Asia College on Mahidol Road. The center offers classes in Hatha Kriya yoga, preksha meditation, tai chi, Jin Shin Jyutsu (a type of energy-restoring massage), foot, hand and ear reflexology. Marcel Kraushaar with a group of his students in front of the Yoga Retreat Center. There is also Shiatsu, where pressure is applied to certain parts of the body, energy massages, psychic readings and a Thai massage course. The center also offers rooms for rent for retreats at the center and a variety of natural foods. The duration of the retreats is chosen by the participants and includes meditation and fasting retreats. Chiang Mai’s Happy H3 is a new club with a mixture of traditional values and progressive thinking. Very democratic, good runs and "on on’s" guaranteed. On on on at Clubroom. Pick-up from Fish ‘n Chip Shop, Ratchawitti Road, 4 p.m. every Saturday.